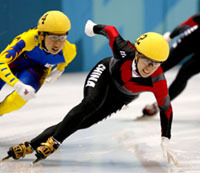 As one of the world's most powerful short-track speed skaters Yang Yang (A) has won a total of 59 world titles in her career in World Championships and World Cup events. At Salt Lake City 2002 she twice struck gold to help end China's gold draught in the Olympic Winter Games and to become China's first woman athlete to win two short-track individual events at one Olympics. After Turin 2006, where she took a bronze medal in the 1000m, Yang Yang (A) announced her retirement in Beijing on 17 August 2006, seven days before her 31st birthday. Entered the Harbin Sports School and switched to short-track speed skating in April 1988. Chosen by the national team for intensified training in 1993. Joined the national team in 1995. Became the first Chinese gold medallist in Olympic Winter Games in 2002. Copyright © 2003 Chinese Olympic Committee. All rights reserved.